The Blog of the Hobbit: Bilbo Baggins - Best Hero of 2012! Bilbo Baggins - Best Hero of 2012! The clear winner by a margin of over 100,000 votes! 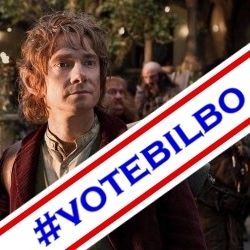 MTV Movie Awards just announced that Bilbo Baggins has won the Best Hero of 2012 award. Fans from all over the world sent in their votes through Twitter and Instagram. I am sure many of you participated in the 1,637,179 tweets and the thousands of photos that that helped Bilbo Baggins soundly beat Snow White, Batman, Catwoman, Ironman, and the incredible Hulk by well over a hundred thousand votes.